The Evolution Instinct is a 7 liter, lightweight trail vest, great for runs ranging from ~1 hour up to an all day outing. 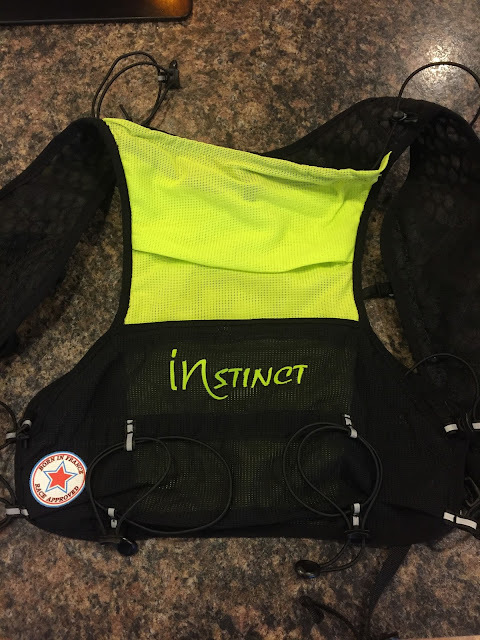 I had never before heard of the French company Instinct, but was recently contacted by Adam at their US distributor, Rocky Mountain Ultra and asked if I would like to test this vest. The Evolution is a fairly minimal pack with a performance oriented fit, consisting of 9 pockets, 5 on the front and 4 in the back. This is a one size fits all pack, but that claim seems like a bit of a stretch to me. I am 5'10", 145 lbs and the Evolution fits me very well, but it seems like it would be a bit of a stretch for it to fit a person 200+ lbs. I would suggest trying on first, but am not sure how one would do so considering their limited availability in the US. 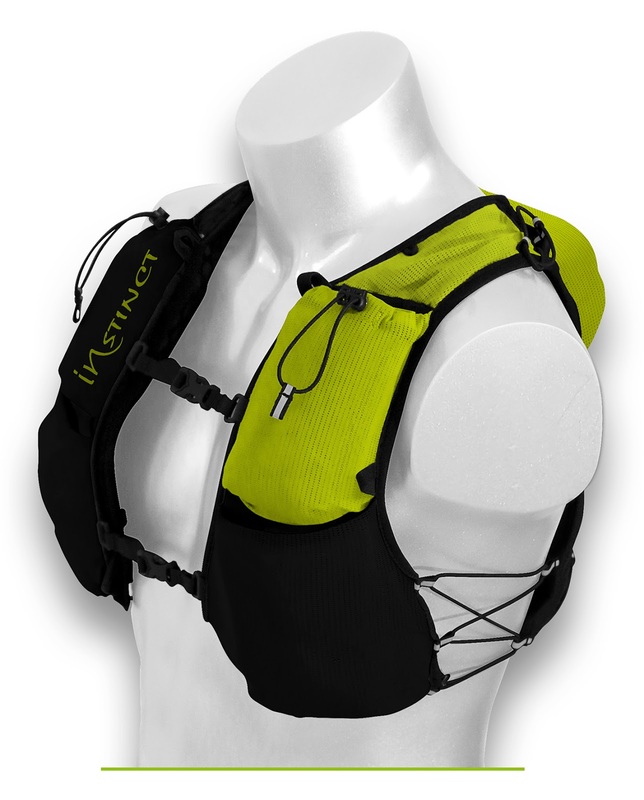 This is a high quality pack, with breathable mesh, ample adjustments and adequate capacity to carry plenty of water, food, a jacket, phone, hat, gloves, poles and other essentials. The 5 front pocket consist of 2 pockets for soft flasks (normal 20oz. bottles fit, but I would not recommend), 2 larger stuff pockets, and a smaller pocket that can hold a gel or two. The small pocket can hold a gel or two and also houses a whistle. Unfortunately, this pocket only flaps shut with no zipper, cinch or fastener, so I would not put anything of value there unless tethered. Instinct suggests using this pocket for tablets and such, but I would still prefer a more secure way to close the pocket. Cinch-able flask pockets on either side, designed for 600ml Hydraflasks. The front stuff pockets on either side easily hold a handful of gels each, a beanie, gloves or a smartphone. The right pocket also has an inner key pocket, but has no clip for the key, or secure way to keep the pocket closed. I do however wish they cinched at the top, as I dropped my iPhone on the ground the very first time I pulled off the pack to dig inside and almost did not notice. I do have a lanyard on my case, so quickly learned to secure the lanyard to the pack with a key biner. 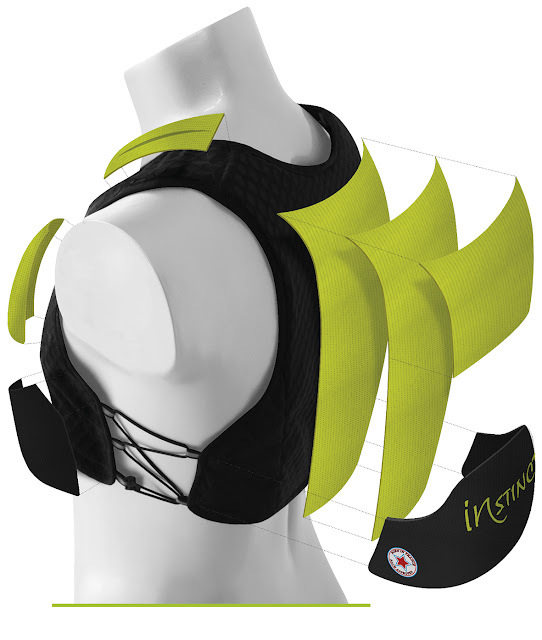 The back of the pack has 4 semi stretch mesh pockets. 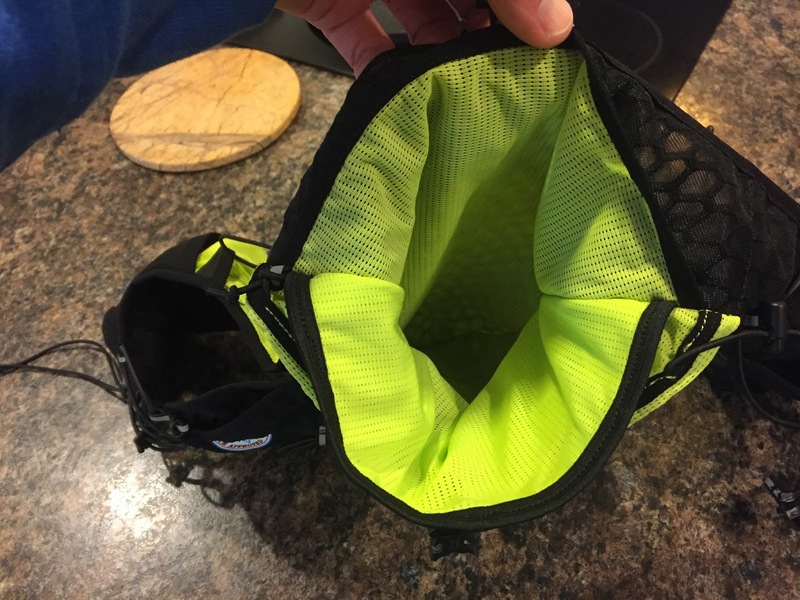 The main compartment, the hydration bladder compartment (that can double as another main pocket for organization), a smaller pocket near the top, and a lower exterior pocket. The rear lower pocket seems handy at first, but there is a large hole on either side, which made me nervous that smaller items I put in there could potentially work their way out. 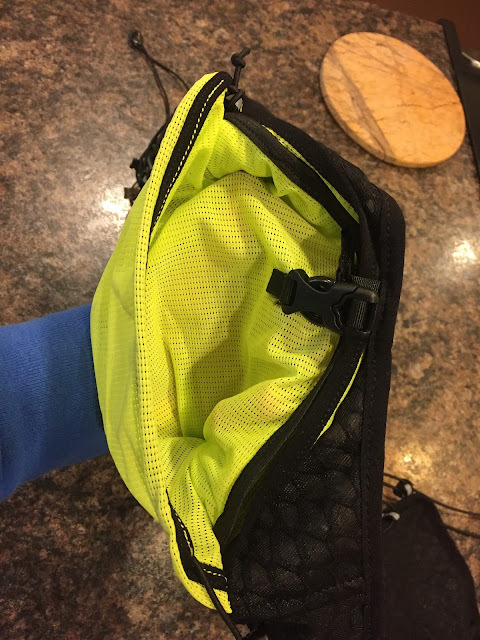 There is an adjustable bungee cord around the perimeter of this pocket, but found that it was difficult to operate and was not particularly effective. I was unable to reach the lower rear pocket while wearing the vest. The main compartment is roomy and can easily hold a jacket, hat, gloves, extra food, Microspikes or a variety of other items. The bladder pocket has a velcro strap at the top to secure the bladder. This pocket can also be used as a second pocket to organize gear. The main compartment closes with one simple clip as shown below. 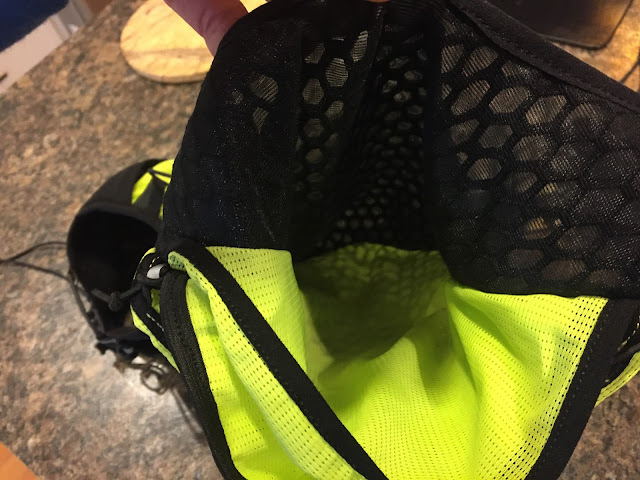 The yellow mesh in this photo is actually the smaller upper pocket just behind the main pocket. 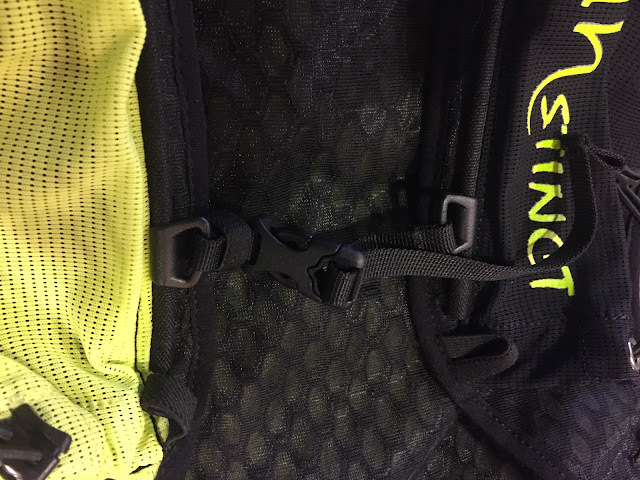 This pocket is accessible while on the move by reaching over your shoulder and secures with a bungee. 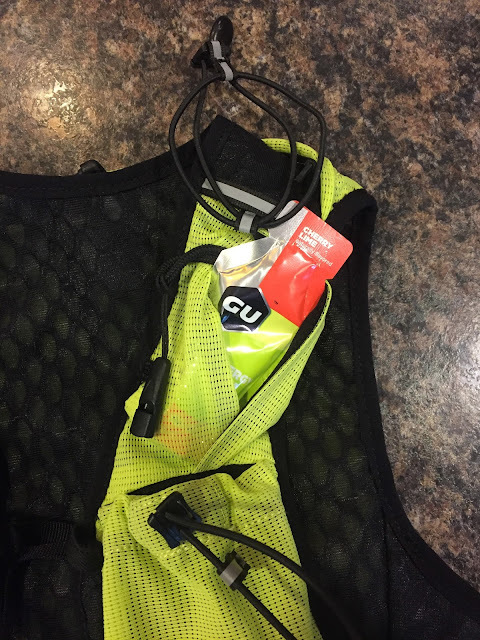 I found that items, such a windbreaker or hat were secure while wearing the pack, but as soon as I removed the pack, the bungee tension is relieved and items in this pocket are loose (something to keep in mind if taking the pack off while on the move or stopped). Two bungees in the back to horizontally hold a set of folding poles. 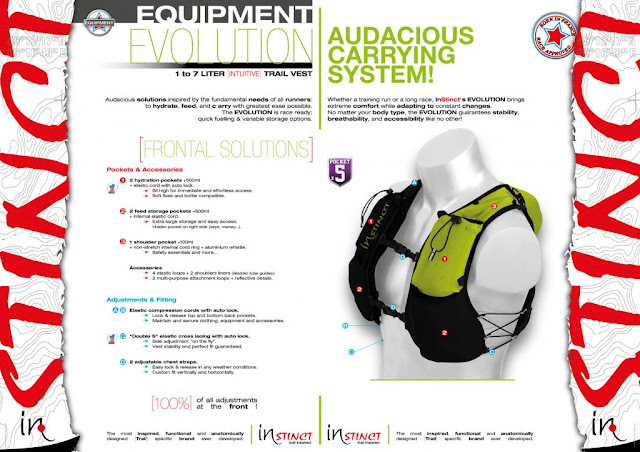 There is also an identical bungee on the left shoulder to carry poles vertically if preferred. 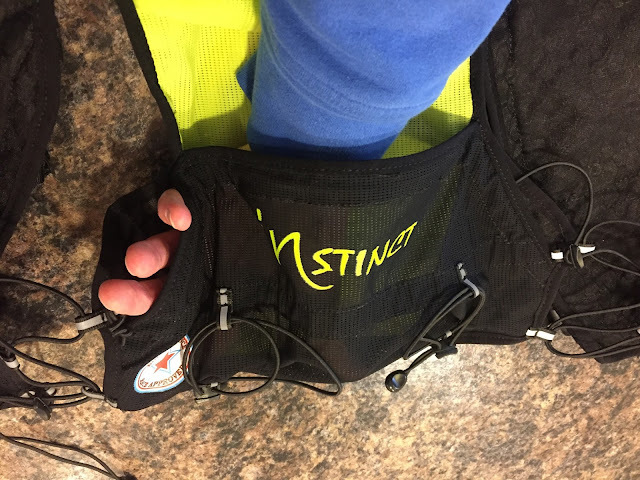 The sternum straps are secure, easy to adjust, clip easily even when wearing gloves and they slide up and down on a flexible rail (which also provides a bit of structure to the front of the pack. I have mixed opinions on this pack. 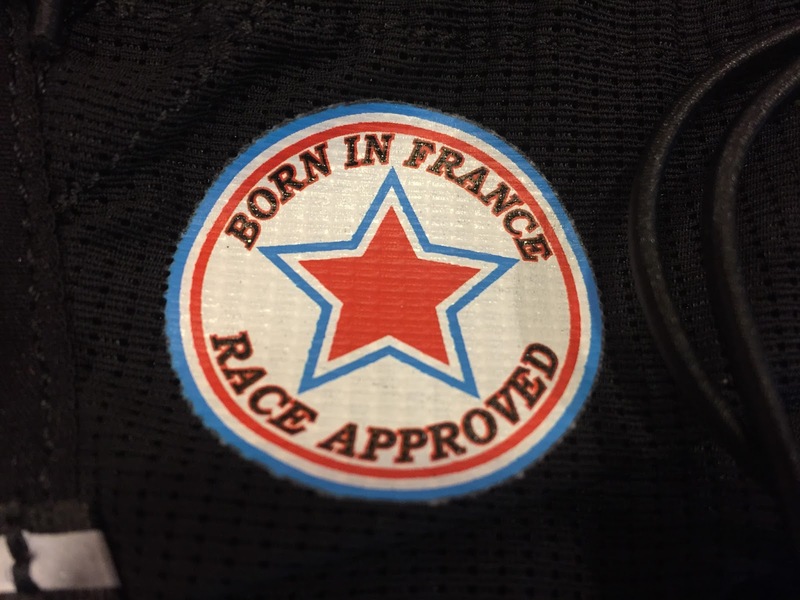 On one hand, it fits well, is high quality and can carry a fair bit of gear very comfortably with little bounce, is very adjustable and breathable. 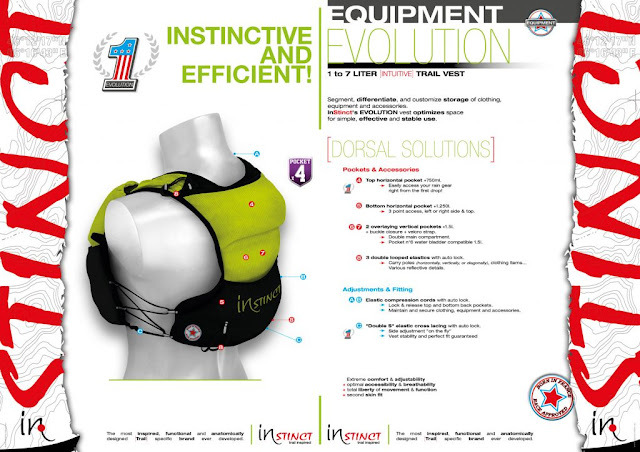 It would make a good race pack due to it's snug performance fit and capacity. The side adjustment bungees are particularly nice, as they conform well and easily adjust. However, it rides quite high on the torso. 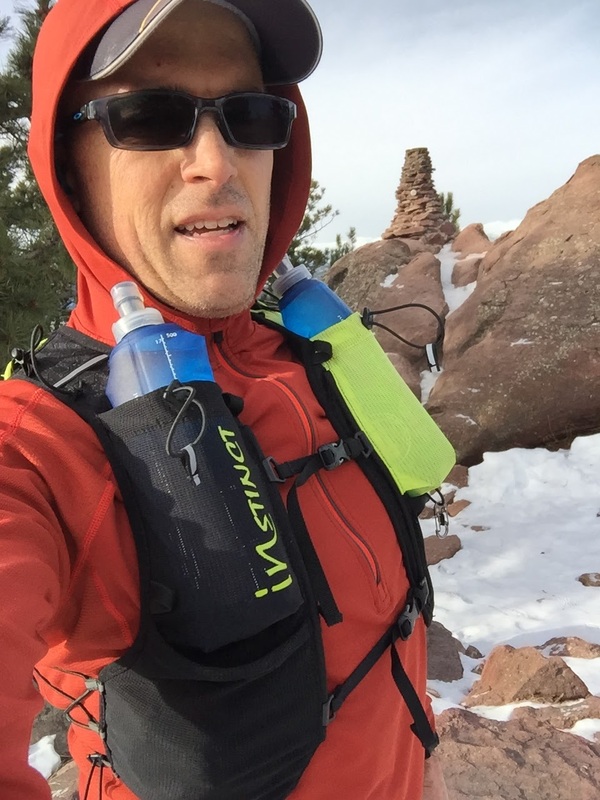 While this may help a bit in minimizing bounce, the front flasks ride so high, that the nozzles smack against my face when they are full and I am running downhill, or leaning forward on steep uphills. Instinct recommends 600ml Hydraflasks, as they are not as tall and thin as the Salomons, so with the correct flasks, it might not be as much as an issue. 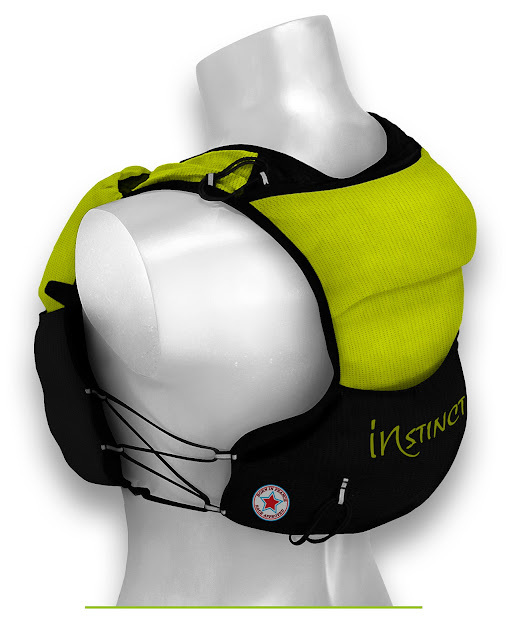 Instinct designed the pockets high so that the flasks can be drank from by simply tilting your head to sip. I like that idea, but if using those pockets for other items, they seem a bit high and it does not allow for many other flask/bottle options. Conversely, you could easily use a bladder and use the bottle pockets for storage instead. Update: 1/26/17 I was able to obtain the recommended Hydraflasks and they work much better than the previous flasks I have used. They sit in a much better position, are comfortable, easy to drink from and are not awkward at all. I still feel the hydration pockets are a touch high for my liking, but that is just a personal opinion. My primary concern however is the inability to confidently secure items in 5 of the 9 pockets. This pack would be greatly improved with cinches on the front stash pockets, eliminate the large holes on the rear lower stash pocket, put a zipper on the whistle pocket and do away with the small rear upper stash pocket, or put some zippers there. A lot of caution and planning needs to be employed to not lose valuable items. 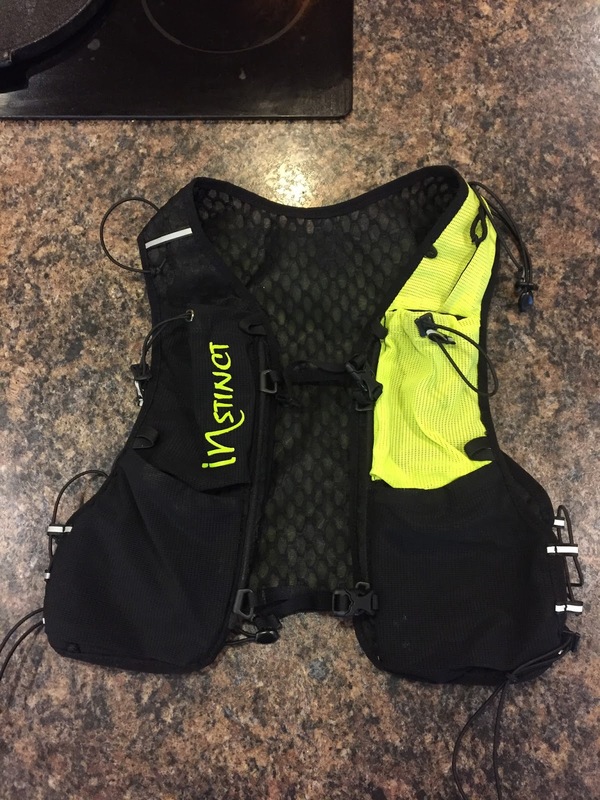 Overall a comfortable, high quality, performance oriented running vest, but I think it has a lot of room for improvement with a few simple fixes. At $100, the Instinct Evolution costs a bit less than it's competitors, but it should be noted that unless you already own the recommended 600ml Hyrdaflasks, you will have to purchase them. At $15-$20 each, this raises the price of this pack such that it equals the price of it's competitors (that do include flasks). -1.5 for lack of pocket security, too easy to have items fall out, particularly when taking the pack off to access the rear pockets. -.5 for riding a bit high, particularly the hydration pockets in the front. 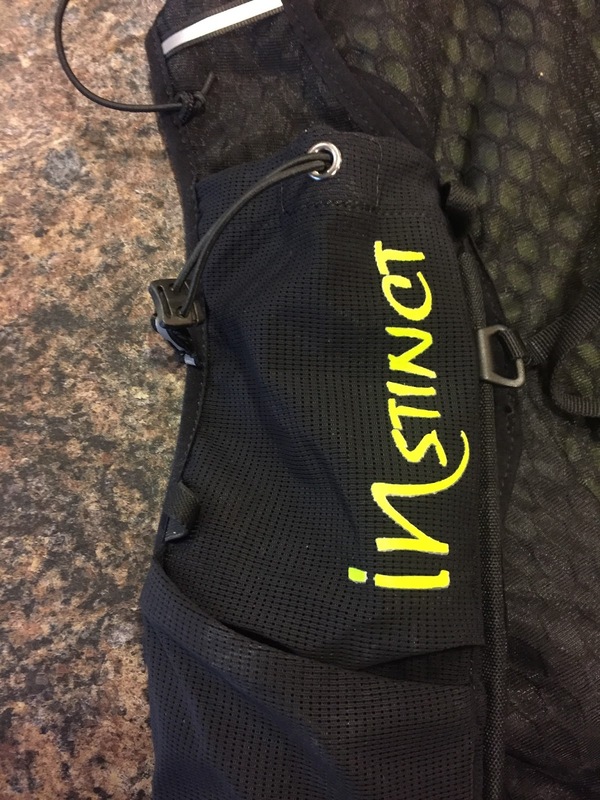 The InStinct Evolution was provided at no charge. The opinions herein are entirely the author's. 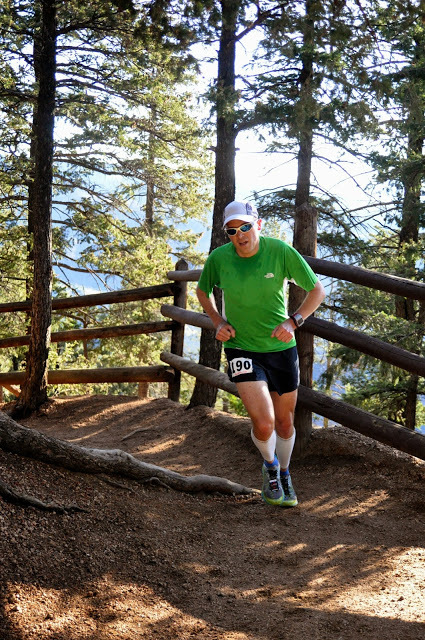 Use Code roadtrailrun10 to take 10% of any purchase at Rocky Mountain Ultra including WAA and Raidlight. The Evolution is a high sitting vest for performance oriented runners looking for a minimalist vest allowing them to effectively run/race any where from a 1 hr run to an Ultra. 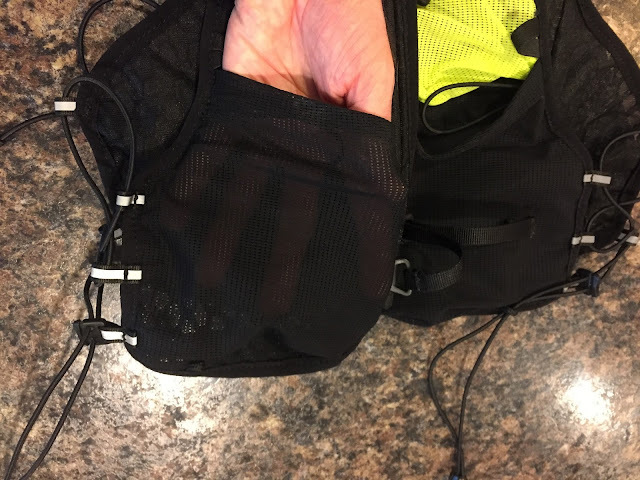 The idea around this product is to use high quality stretch mesh allowing to greatly increase it's capacity all while ensuring a stable fit and firm hold of your item. Accessibility is key and the ability to adapt to any distance or desired way of carrying one's supplies is critical. Adding extra gadgets, zippers, etc is avoided. All hydration and food is carried in the front. Anything one needs to quickly get such as rain jacket and poles are held in the back and accessible without taking pack off. In the front, soft flasks are carried in the top pockets. Long elastics with cord lock allow a firm hold around the screw cap. 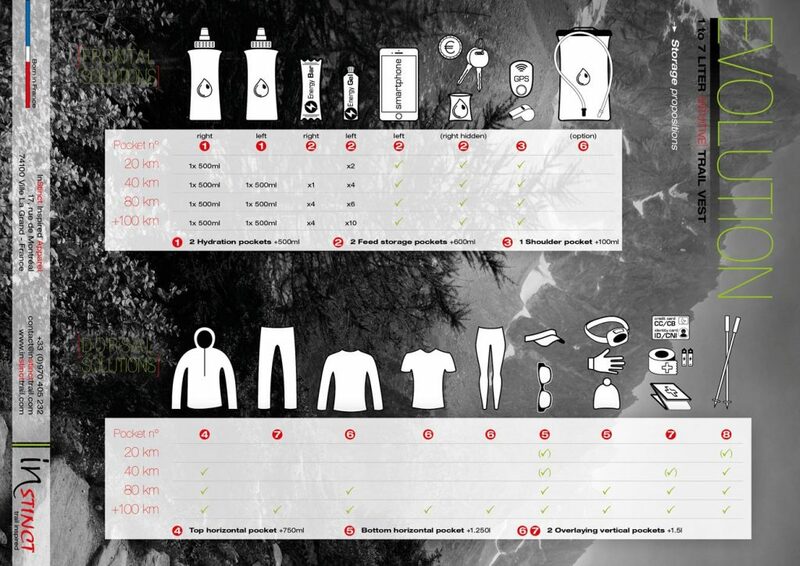 In the test Salomon flasks were used. These are not the best fitting as they are very long and thin. They come up too high and disturb. Hydrapak 600ml are the best and InStinct has some coming out in 2017. Hydrapak flasks allow the perfect height. The idea is to be able to just turn one's head and drink easily without the bite valves coming up too close. And it works perfectly. The only time needed to take the flask out is when refilling. We all know the pain it is to pull in and out the flask when racing. In the large lower front pockets, one can carry about 12 gels per pocket, or anything else. The elastic loops inside both of these allow firm hold in case one wants to carry their softflasks or bottles in these. Inside the lower right pocket is a hidden key pocket. On the shoulder the green pocket with whistle is made to carryfor example one's salt tablettes. Many put these in a plastic sachet and tug them inside. The side elastic lacing offers a perfect fit. One can singe down all cords and bands in order to get a secure non-bouncing fit all while being able to breath freely. Everyone knows how annoying it is to loosen the straps to breath better uphill, and then tighten when going back down. It's also important to know that all end caps come off the elastic cables. This means the user can cut and shorten them. One can also reroute the side lacing in need for bigger sized runners :) Ever get annoyed to having to take the pack off to get your rain gear? Within a second one just throws your hand over your shoulder and grab or put back the rain jacket. That's what this pocket is made for and it's a major feature for on the fly access. Many athletes also put their glasses, extra soft flask. 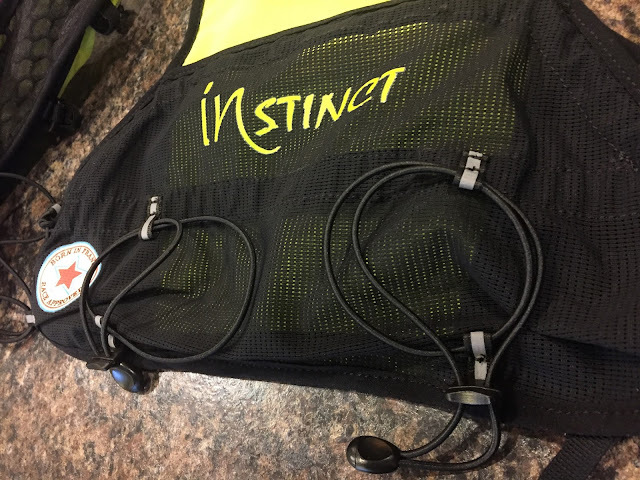 Wearing a bright headlamp with heavy battery? Just place battery in the the top pocket; Keeps one's head lighter and battery is snug in pocket. Top back pocket. There's an elastic compression cord that runs along the inside of the pocket. While running one can just grab the end cap on one's shoulder and pull. It'll singe down the entire pocket. 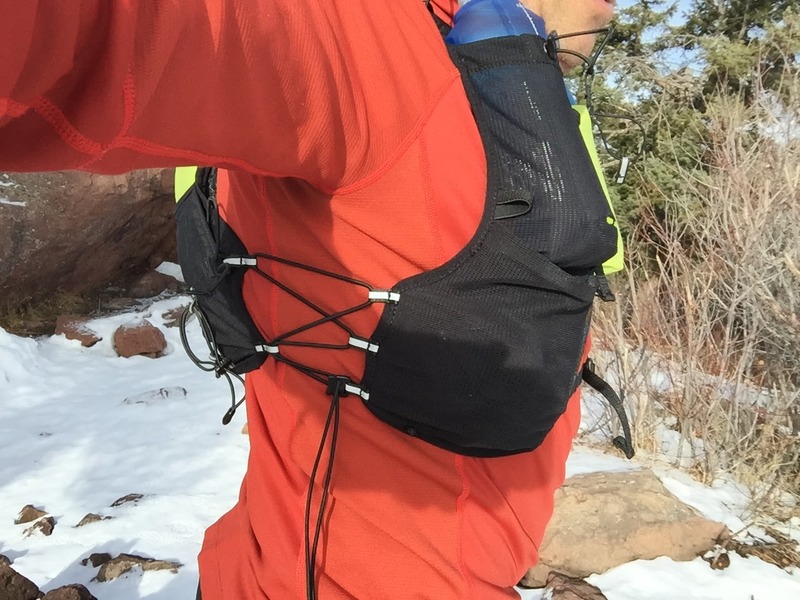 The are three ways to carry poles with this pack. Along the bottom pack, and well as vertically or diagonally. The elastic loop with cord lock on the left should is made the easily grab and slide through one's poles. The ends can either go through one of the bottom loops, or even just into the lower black mesh pocket. Back vertical pockets allow for segmented storage. One of the most appreciated features of this pack is just how comfortable and stable it is while having it fully loaded. Another important point is pricing. It is up to 30% less than many packs in this size category. The best materials are used and the pack offers a true technical and value product to consumers. A few will notice athletes like Javier Dominguez: Team Vibram ( podium in the '16 UTMB, Diagonale des Fous, top 3 in '16 Ultra Trail World Tour), or Andrea Huser ( 2nd at the '16 UTMB, 1st at Diagonale des Fous, podium in the '16 Ultra Trail World Tour), and many others have adopted the use of this sleek performance oriented product. Thank you very much for the detailed feedback. I made several corrections based on your input here.